It may come as a surprise to cradle Catholics, but one of the Protestant objections I heard fairly often to the sacrament of Penance was, “Well, you’ve got to admit there’s no way to ensure people aren’t just going into the Confessional and lying to the priest about their sins. And since you can’t keep people from abusing the ‘system,’ what’s the point of it? You might as well get rid of it.” Sad to say, but I myself used to think this contention carried some weight. Having now been to Confession a number of times, though, I can see how flimsy this argument is. First, the idea that a person would go to all the trouble to go to Confession only to lie to the priest when he gets there completely misses the psychology of the whole thing. The Church can’t make anyone show up at the Confessional. You have to choose to go there, and the Church doesn’t keep Confessional attendance records so you’re not getting any brownie points simply by going. But the Protestant who makes this argument assumes that the people who go to Confession care enough about their souls to feel compelled to go through the motions of Confession but not enough to avoid the sin of lying to the priest while making their confession. What kind of person would do that? It’s nonsense. 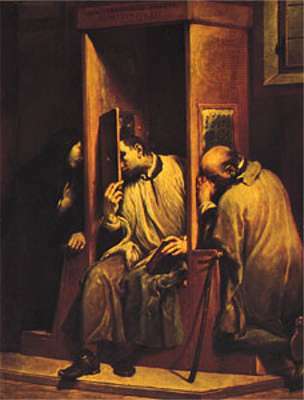 The very last thing the penitent wants is to leave the Confessional with a guiltier conscience than when he entered it. That defeats one of the very purposes of Confession. Second, this Protestant argument against Confession is based upon an utterly cynical view of human beings and rests on the unstated assumption that people—even baptized Christians—are incapable of doing anything good for their souls. This complete lack of faith in the human capacity for good rears its ugly head fairly regularly in Protestant arguments against Catholicism, and I may address it at greater length in the future. For now, though, I’ll just say that, contrary to what seems to be the Protestant assumption, the denigration of man does not equate to the exaltation of God. Man was created in God’s image and, even though that image was marred by the Fall, it was not obliterated. And while it is true, as Chesterton says, that as “a man,” I am the chief of sinners, it is also true that as “Man,” I am the chief of creatures. Third, and finally, the assertion that a system should be abandoned simply because it can be abused is silly. No one says, for example, that, just because there’s such a thing as election fraud, we shouldn’t have any elections. Rather, any abuse of the Confessional is a reason for those Catholics who care about this sacrament to approach it with even greater sincerity and reverence. The Confessional is one of God’s greatest gifts to His Church—the means by which an individual sinner can know with complete confidence that his sins have been forgiven and that he’s been given the opportunity for a fresh start. Can it be scorned, misused, and treated with contempt? Sure it can. But if we reject it on the basis that it’s open to mistreatment, it seems to me we’d have to say we must also reject Christ Himself—Who was (and still is) scorned, misused, and treated with contempt. This entry was posted in Confession/Reconciliation, Jason and tagged confession, lying to the priest. Bookmark the permalink. 10 Responses to But Can’t I Just Lie to the Confessor? I am sure that some would lie because they themselves cannot believe they did such a thing to start with….but, they know there is forgiveness and they need it….that is the point. There is no sin that man has done, that Jesus did not die for, and that Jesus would not forgive? Right? Absolutely right. Once I’ve gone to Confession and confessed my sins fully and honestly and the priest has spoken the words of absolution, I can be 100% certain I am completely forgiven–no matter what the sins were that I confessed. I can also be sure I’ve been forgiven for the sins I honestly forgot to confess. In John 20:23, Jesus delegates the power to forgive sins to his disciples. How did you make sense of this verse as a protestant? If it was God’s intention that we confess our sins to him alone in prayer, then why would Jesus have shared this with his Church at all? I can see people interpreting this verse differently than Catholics do, but what I can’t see is people who say that Catholics are wrong to look for forgiveness of God from another person. For myself, I just didn’t deal with this verse as a Protestant. I think the best a Protestant could do, though (as you suggest), would be to argue that this verse isn’t authorizing a specific group of people, i.e., the Apostles and their successors, to forgive sins, but rather is authorizing all Christians to exercise the authority to do so. This would thus support the ad hoc development of the “accountability groups” Protestant churches have a tendency to talk so much about. I talked about the way these accountability groups tend to play out in practice here. The fact that these groups are subject to inherent tensions and tend to degenerate over time, while the Catholic practice of Confession has gone on for centuries, is (at least to me) confirming proof that the Catholic interpretation of John 20:23 is the correct one. For me I suppose the issue with confession is why do I need to confess my sins to a man, who is as falable as I am, when Christ, by dying on the cross, became our ultimate mediator? For that matter, why do we need to ask the saints for intercession, when we can simply pray to Christ? Forgive me if my “protestant filter” is on. I’ve begun the RCIA process, and this is one of the questions I’ve been wanting to ask. Thank you very much, and God bless you. Thanks for the questions, Travis. I’d defer to the priest leading your RCIA, but I’ll give you my take on them. The Church teaches that it is Christ who is forgiving sins in the Confessional–not the priest. The priest is merely Christ’s authorized spokesman for the words of absolution. So why is it necessary? Because it helps us humans to actually hear the words of absolution aloud–that way, there’s no doubt we’re forgiven. We can take it to the bank. Does this mean God can’t forgive sins without the Confessional? No–the Catechism clearly teaches that God is not bound by His sacraments. But, if we’ve been given this gift, why would we turn it down? It also satisfies the deep human need to get the worst about us off our chest to some human being who can actually help us. On your question about the intercession of the Saints, the reason is the similar to why we ask our friends here on earth to pray for us. Of course we can always go straight to Christ. But that doesn’t mean it’s wrong to ask others to pray for us. Scripture tells us that the “effectual, fervent prayer of a righteous man avails much.” Who better, then, to pray for us than those who’ve already made it to Heaven? I’ve been reading through your blog as some very dear friends have decided to join the Catholic church and, while I have had other questions to other posts, this one in particular confused me. If Christ, the Man/God intentionally allowed himself to be crucified so as to forgive every single one of your sins, how can you doubt that when you pray to him for forgiveness you haven’t been forgiven? Why do you need the reassurance of a priest that is not actually forgiving your sins? Thanks for the question, Allison. I see the sacrament of confession as a gift. I agree with you that God can forgive sins any way he wants, which the Catechism teaches. But, by giving us the sacrament of confession, he gave us a way of audibly hearing the words of absolution. That is a tremendous comfort. And I can’t think of a good reason not to take advantage of it.